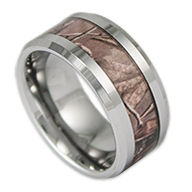 This page contains some awesome Camo Tungsten Rings and bands. Whether you are a hunter looking to blend into your surroundings, or a veteran who just loves the looks of woodland or desert camouflage - these rings are for you! Not only do we have men's rings on this page, but we also have women's rings. We even have couples camo ring sets! These rings are very popular as wedding bands, and of course being Tungsten, they will last a lifetime. All of our Tungsten Wedding Rings come with a free ring box and are eligible for our Lifetime Warranty! Click here to learn more about Tungsten!